Bordered by water on three sides, Florida is arguably one of the states most vulnerable to climate change. Over 14 million people (75 percent of the state’s population) live in coastal counties, and Miami ranks first in the world in terms of total assets at risk to a 100-year coastal flood event. Hotter temperatures, changing rainfall patterns, more powerful tropical storms, and rising sea levels will threaten communities across the state. Having grown up in Florida, it’s all too easy for me to imagine how these impacts will affect people’s lives. My grandparents’ house on the Gulf coast could be flooded more frequently. The well my parents use to pump drinking water from the Floridan aquifer could soon run dry. 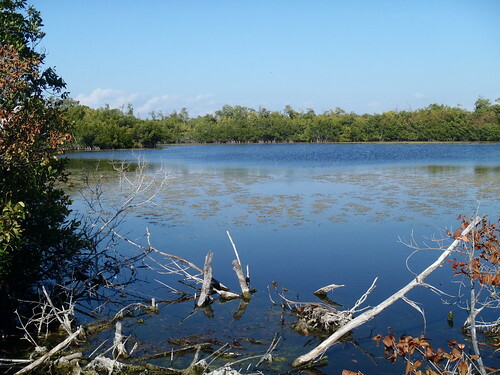 And the beautiful wetlands and coastal mangroves I’ve enjoyed my whole life could be lost to sea level rise. By 2070, nearly 5 million people and $3.5 trillion in assets could be flooded by a 100-year coastal flood in the Miami area alone. Sea level rise of a little more than 2 feet would place 9 percent of the state’s current land area underwater at high tide (over 99 percent of Monroe County and nearly 70 percent of Miami-Dade County)—an area with a population of 1.5 million. The bread-and-butter tourism industry could lose $40 billion annually by 2050 and $167 billion annually by 2100 if no action is taken. Greater evaporative losses from surface water reservoirs would affect water availability. Drought events could contribute to saltwater intrusion into coastal freshwater aquifers, contaminating drinking water supplies. Given the enormous risks to the people, economy, and resources of Florida, you would think that state agencies would be busy developing plans and policies to reduce vulnerabilities. Think again. According to a new NRDC report released today, Florida lags far behind other states in preparing for climate change impacts. Under former Governor Charlie Crist, the state seemed well on its way to getting ready—statewide greenhouse gas pollution reduction goals were set, and the Florida Energy and Climate Commission was established to implement actions to reduce emissions of global warming pollution and prepare for climate impacts. However, under the administration of current Governor Rick Scott (who doesn’t believe in man-made climate change), the commission has been abolished and state agencies are doing very little to prepare for climate change. Thankfully, regional groups like the South Florida Water Management District and the Southeast Florida Regional Climate Change Compact are acting and taking leadership. Cities like Miami also are preparing for climate change (as detailed in our Thirsty for Answers report). But state agencies play an instrumental role in prioritizing and supporting statewide planning. They still need to do their part and prepare for the looming impacts of climate change—our health, livelihoods, communities, and future generations depend on it.